LLOYD'S BEWARE THE BLOG: FRANK SINATRA: The "Numbers" Movies: "Ocean's 11", "Sergeants 3", "4 for Texas" and "Robin and the 7 Hoods"
FRANK SINATRA: The "Numbers" Movies: "Ocean's 11", "Sergeants 3", "4 for Texas" and "Robin and the 7 Hoods"
I still love Frank Sinatra and "The Rat Pack". I saw Frank, Dean and Sammy in Las Vegas as a teenager. I had a Great Aunt who knew him, but she also had an ex-husband that had been working the Flamingo since Bugsy Siegel built it in 1945 and got us comp at the Sands. In his 67 motion pictures the man my mother knew as "The Voice". 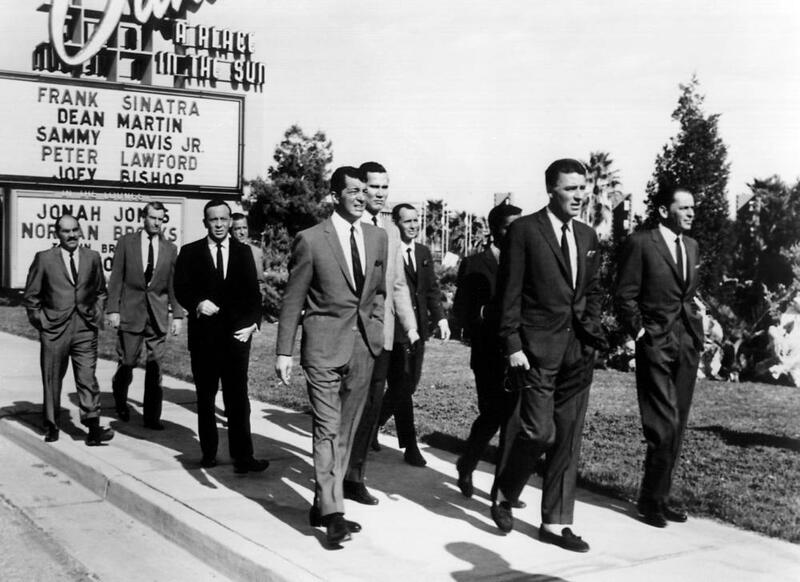 Had appeared with Dean Martin 5 times, Sammy Davis, Jr. 3 times, Joey Bishop and Peter Lawford 2 times each. Within those 67 films are 4 that I refer too as the "Number Movies", because the titles simply have a number in them. 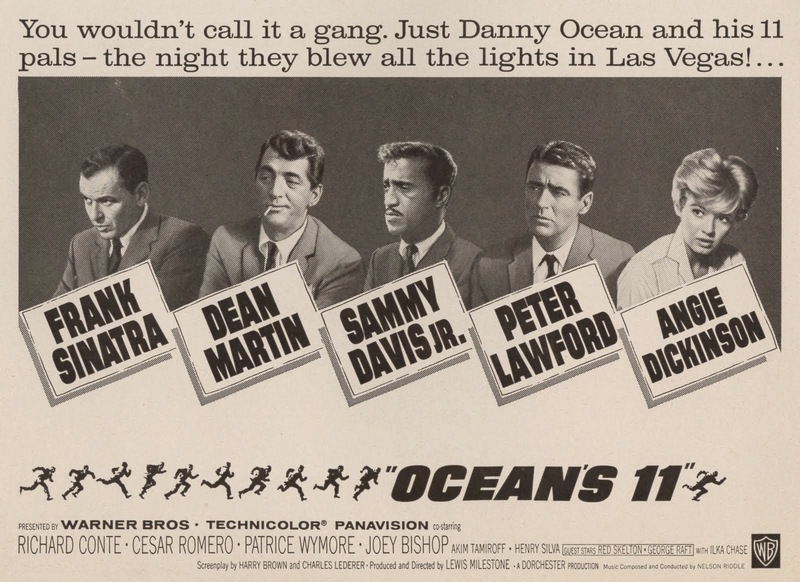 OCEAN'S 11 premiered August 3, 1960 in Las Vegas, Nevada. If critics mean anything, to them, "Ocean's 11" bombed at the time of its release, but what do critics know? The picture was pure fun and besides the movie had "Frank Sinatra and his "Rat Pack"" as the draw. Which was why people went to see the picture. We all knew what to expect and a very dramatic heist plot like the previous years "Odds Against Tomorrow" starring Robert Ryan, Harry Belafonte and Shelley Winters that critics looked for . 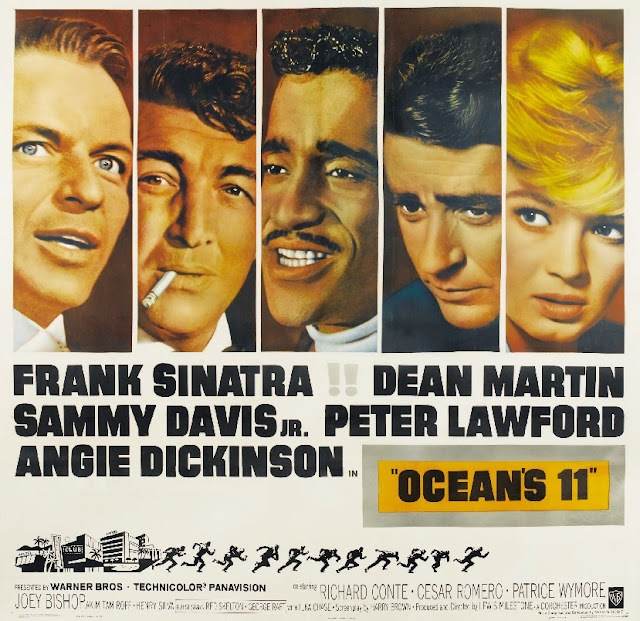 "Ocean's 11" was the 8th Top Grossing film of 1960. In the United States 162 motion pictures were released that year, The top 7 were Stanley Kubrick's "Spartacus", Alfred Hitchcock's "Psycho", Otto Preminger's "Exodus", Walt Disney's "Swiss Family Robinson", John Wayne's "The Alamo", Billy Wilder's "The Apartment" starring Jack Lemmon and Shirley MacLaine, and "Butterfield 8" with Elizabeth Taylor's Best Actress Performance. Coming in 8th in that company showed up the critics. 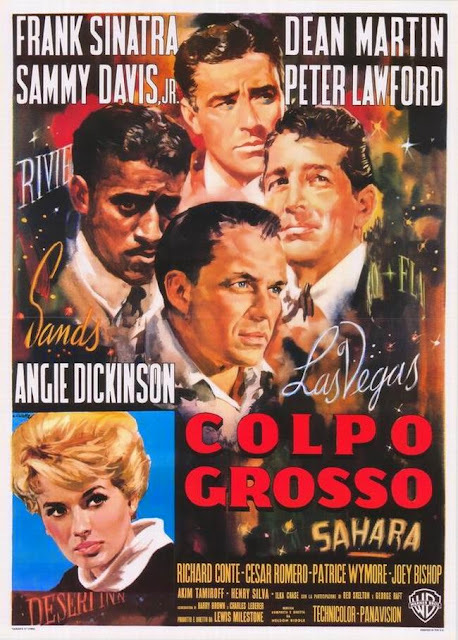 Richard Conte as "Tony Bergdorf", Buddy Lester as "Vince Massier" Joey Bishop as "'Mushy' O'Connor", Sammy Davis, Jr as "Josh Howard"., Frank Sinatra as "Danny Ocean", Dean Martin as "Sam Harmon", Peter Lawford as "Jimmy Foster", Henry Silva as "Rodger Corneal", Richard Benedict as ""'Curly' Steffans", Norman Fell as "Peter Rheimer" and Clem Harvey as "Louis Jackson". Below is a still from near the end of the picture as "Danny Ocean's" remaining members walk past the billboard for the "Sands". Note who it indicates are appearing in the main showroom that night. The hotel was associated with the "Rat Pack" for many years. Besides the 11 above actors the story contained three other main characters. 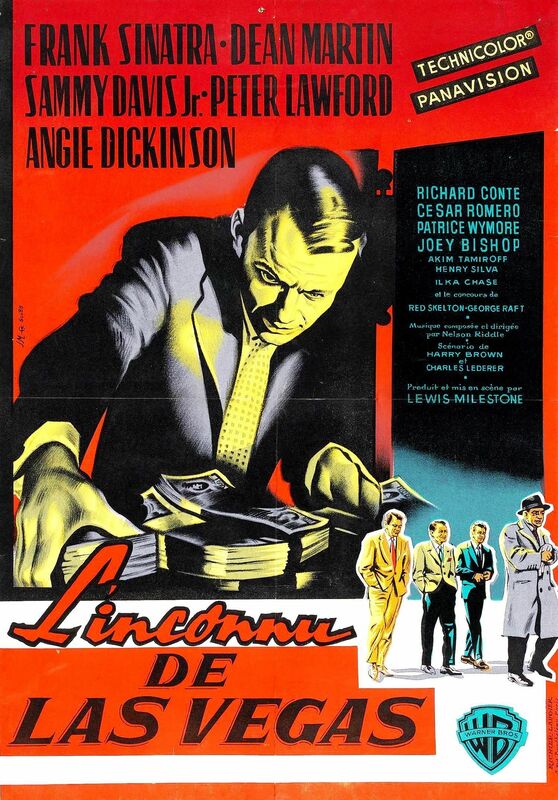 As posters for the film indicated one was actress Angie Dickinson. Dickinson played "Beatrice Ocean", "Danny's" wife. She was at times considered as the only women in the "Rat Pack". 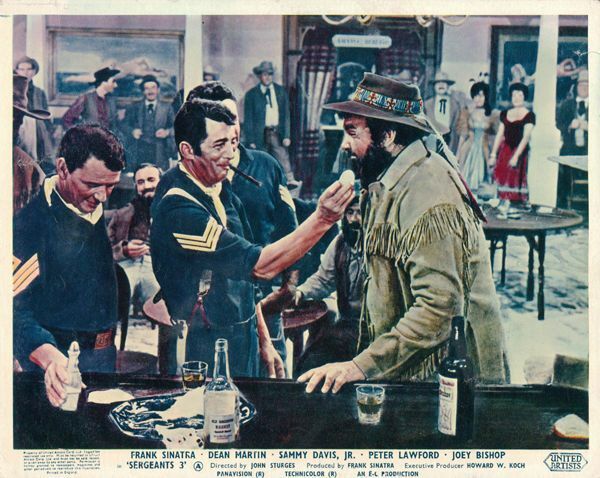 Dickinson had met Dean Martin while they filmed Howard Hawks' classic Western "Rio Bravo". That also starred John Wayne, Ricky Nelson and Walter Brennan. Below two stills of Angie Dickinson. Cesar Romero was "Reformed" mobster "Duke Santos". Romero, who had started acting in 1933 and like many established actors looking for work, had moved to the medium of television. The year prior to this release Cesar Romero had portrayed the dashing "Esteban de la Cruz" in four episodes of Walt Disney's "Zorro". Later he would be "The Joker" on the "Batman" television series starting in 1966. The third role was that of "Spyros Acebos" the backer of the robbery, portrayed by character actor Akim Tamiroff. Tamiroff started acting in 1932 and in 1944 won the first ever Best Supporting Golden Globe Award for the movie "Whom the Bells Tolls" and was nominated for the Oscar as Best Supporting Actor. Trivia: Akim Tamiroff was the inspiration for the character of "Boris Badenov" on "The Rocky and Bullwinkle Show". According to writer and film critic Shawn Levy in his 1998 "Rat Pack Confidential: Frank, Dean, Sammy, Peter, Joey and the Last Great Show Biz Party". 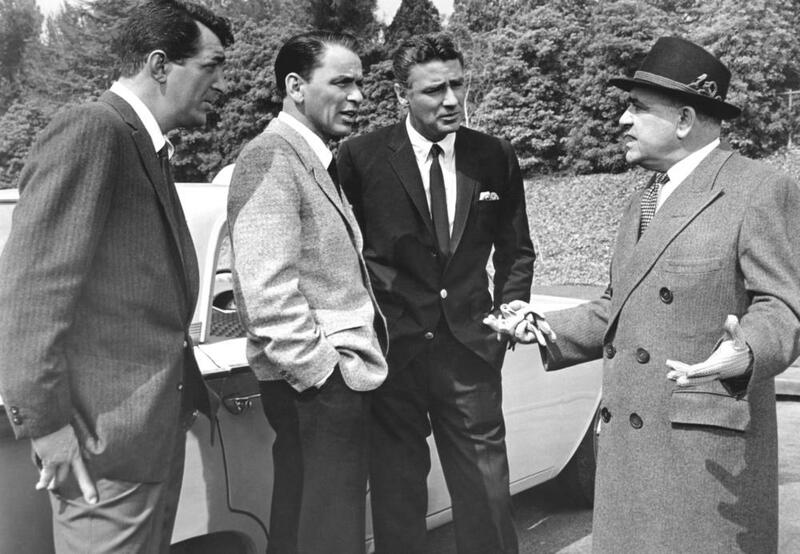 Peter Lawford first heard of the story idea for "Ocean's 11" from television Director Gilbert Kay. Who had gotten it from a gas station attendant. Forget the movie, lets pull the job! The plot is very simple and has "Danny Ocean" bringing in a group of his old army buddies, from the World War 2, 82nd Airborne, to rob five major hotels on the Las Vegas Strip. The robbery will be a precision military operation taking place exactly at the stroke of midnight on New Years Eve. As the new year is brought in and confusion reigns as hotel guest celebrate and the casino's are overly crowded. The hotels in question were the "Sands", the "Sahara", the "Riviera", the "Desert Inn" and my families favorite, at the time, the "Flamingo". As the final planning goes on "Danny's" wife "Beatrice" makes an appearance. "Beatrice" helps to establishes some of "Danny's" background. 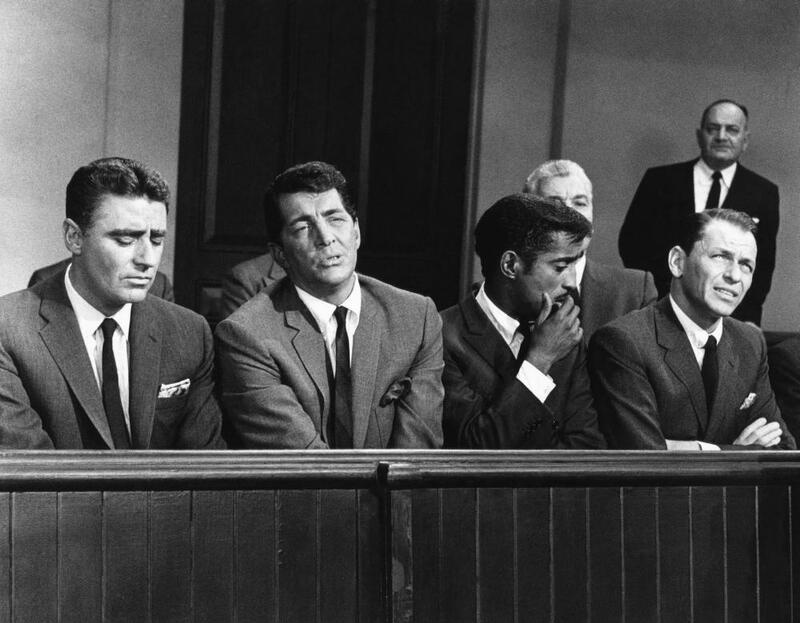 Like all the characters she is thinly drawn and the choice of Dickinson was more, because she was part of the "Rat Pack" and a friend of Frank and Dean's. As were many of the actors in the motion picture. 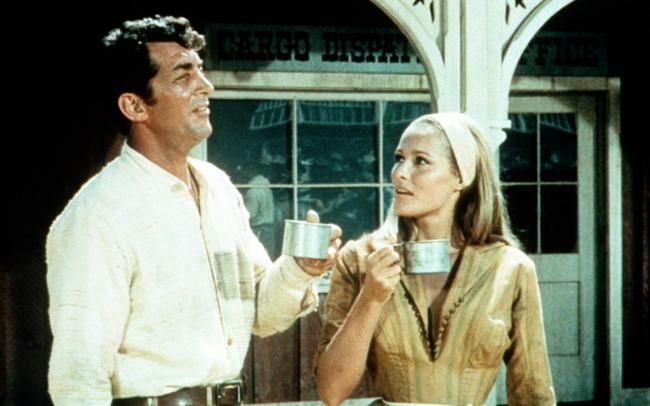 Below a publicity still of Angie Dickinson and Dean Martin. Prior to the robbery "Spyros Acebos" meets with "Ocean", "Harmon" and "Foster" over the planned robberies wanting to put pressure on them. He's more a comic character and the three men just tolerate his utterances making him think he's very important. The robbery goes off without a hitch and the sacks of money are tossed into a truck driven by Sanitation worker "Josh Howard". Below "Lawford", "Martin" and "Sinatra" have to put on Black Face, part of a joke and a sign of the racial times, to look like "Davis, Jr." and most of the Sanitation workers in Las Vegas. Speaking of the sign of the times. About 1960 the Worldwide Jewish Service Organization the "B'nai B'rith" held a major dinner ceremony at the famed "Beverly Hills Hotel". The entertainment was to be Sammy Davis, Jr. and when he came out to entertain. My mother described him, to me, as looking as "White as a sheet". The prestigious "Beverly Hills Hotel" would not let Sammy Davis, Jr. enter through the front door, or go through the lobby to the ballroom the "B'nai B'rith" was using, Being Black he had to go around to the back of the hotel, enter through the kitchen and be escorted to the ballroom. Needless to say the Jewish organization never used the "Beverly Hills Hotel" again. After pulling money out for "Tony's" wife. The rest is placed inside "Bergdorf's" coffin to be transferred to San Francisco without the police discovering it. However, the plan backfires on everyone as the Funeral Director convinces "Tony's" wife to cremate him in Las Vegas to save money. 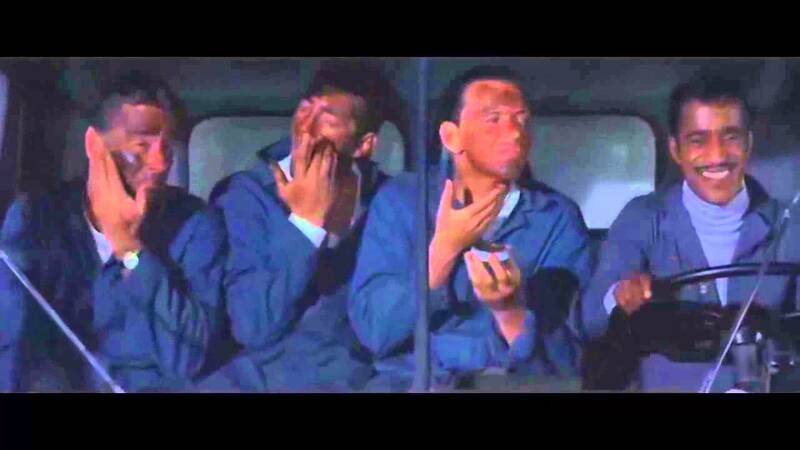 There's a great scene of "Ocean's": now ten, "Santos" and "Acebos" at the funeral home discovering what has taken place and it is the looks on their faces which are classic. There were three cameo's in the feature. Comedian Red Skelton appeared as himself. Actress Shirley MacLaine was a "tipsy drunk" that Dean Martin kisses and George Raft portrayed "Jack Singer" a casino owner. It took 41 years to remake "Ocean's Eleven". George Clooney was "Danny Ocean" and "Brad Pit" "Rusty Ryan". The picture was released December 7, 2001 and would be followed by two sequels "Ocean's Twelve" on December 10, 2004 and "Ocean's Thirteen" on May 24, 2007. On June 8, 2018 Sandra Bullock was "Danny Ocean's" sister in "Ocean's 8" with an all female group. Today many Millennial's and others pan the original 1960 motion picture as being too slow compared mainly to the George Clooney film. In 1888 British author Joseph Rudyard Kipling, "The Jungle Book", "Kim", "The Man Who Would Be King", published a collection of stories entitled "Soldiers Three". On February 17, 1939 Directed by George Stevens. RKO Pictures released Victor McLaglen, Douglas Fiarbanks, Jr. and Cary Grant in "Gunga Din" with Sam Jaffe in the title tole. The feature was set during the British Raj of the "Empress of India" aka: "Queen Victoria". 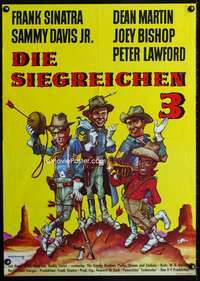 In April 1951 MGM released a semi-remake of "Gunga Din" entitled "SoldiersThree". The feature starred Stewart Granger, Walter Pidgeon and David Niven. Moving the story from the British Raj to the American Indian Territory of 1870 was "Sergeants 3". 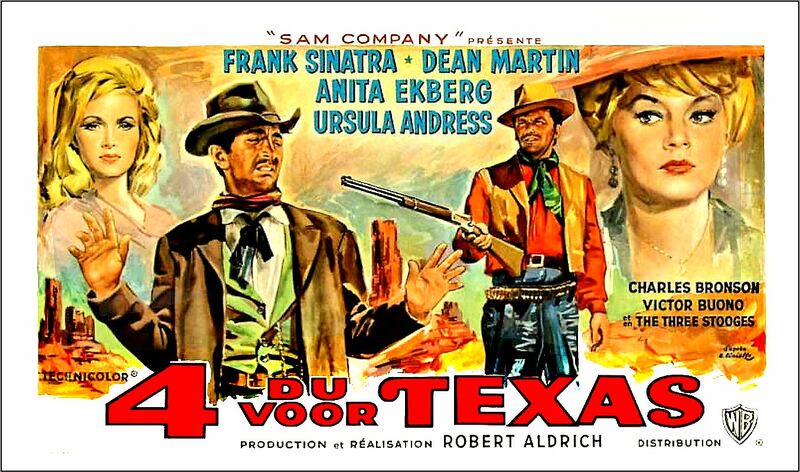 Producer Frank Sinatra hired John Sturges to Direct. For motion pictures with a Western theme Sturges was the perfect choice. His films included 1953's "Escape from Fort Bravo" starring William Holden and John Forsythe, 1957's "Gunfight at the O.K. Corral" starring Burt Lancaster and Kirk Douglas and 1960's "The Magnificent Seven" starring Yul Bryner and Steve McQueen. 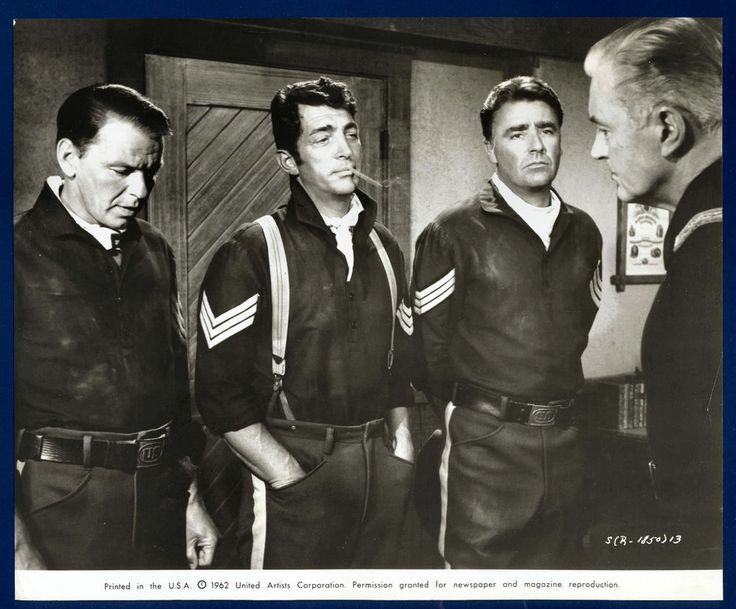 He had also Directed Sinatra in the 1959 World War 2 drama "Never So Few" with Peter Lawford. In 1963 John Sturges Directed "The Great Escape" and later in 1968 "Ice Station Zebra". 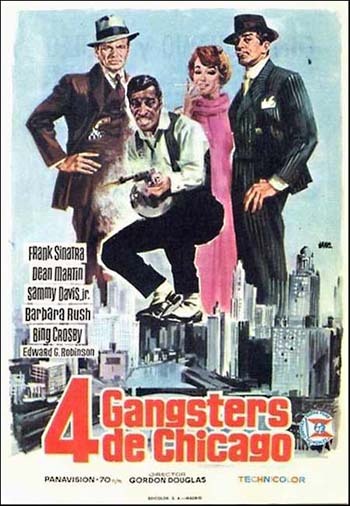 The screenplay was by W.R. Burnett who had written two excellent gangster movies. 1930's "Little Caesar", that introduced Edgar G. Robinson, based upon Burnett's his own novel and 1932's original "Scarface". Another novel Burnett turned into a screenplay was "The Dark Command" starring John Wayne and co-starring Roy Rodgers and Walter Pidgeon. He also wrote the screenplay for the Humphrey Bogart and Raymond Massey World War 2 drama "Action in the North Atlantic" and after this screenplay. W.R. Burnett wrote both the screenplays for "The Great Escape" and "Ice Station Zebra". Should you be familiar with the 1939 original/ Then picture Frank Sinatra's "First Sergeant Mike Merry" as "Victor McLaglen", Dean Martin's "Sergeant Chip Deal" as Cary Grant, Peter Lawford's "Sergeant Larry Barrett" as Douglas Fairbanks, Jr. and Sammy Davis, Jr. as "Sam Jaffe".Joey Bishop was "Sergeant-Major Roger Boswell". 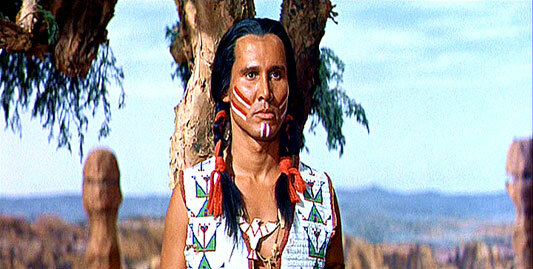 Also from "Ocean's 11" were Henry Silva as Native America "Mountain Hawk". Silva was born in Brooklyn and was part Sicilian and part Portuguese. He is probably best known as the North Korean agent in John Frankenheimer's 1962 "The Manchurian Candidate" also starring Frank Sinatra. See the link below. 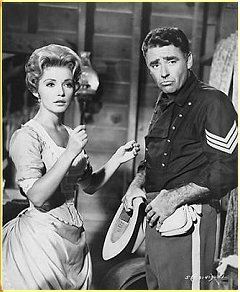 Actress Ruta Lee was "Amelia Parent". Lee was a Canadian actress and dancer. She made her first on screen appearance as one of the "Brides" in the musical "Seven Brides for Seven Brothers" and was in another musical "Funny Face" starring Fred Astaire and Audrey Hepburn. Lee also appeared in some strong dramatic roles in films such as "Witness for the Prosecution" and "Operation Eichmann". In 1964 Ruta Lee phoned Soviet Premier Nikita Khrushchev asking him to release her grandmother Ludvise Kamandulls. Who had been in an internment camp since World War 2. It worked and for two years she lived until her death in freedom with Lee. In 1987 Lee was able to rescue an 18 year old cousin Maryle Kaseta. Also billed were "The Crosby Boys" a singing group of four brothers and the son's of Bing Crosby. Actually in the picture only three of the four boys were in it. They were Phillip Crosby as "Corporeal Ellis", Dennis Crosby as "Private Page" and Lindsay Crosby as "Private Willis". Brother Gary did not appear Also in the cast was Australian actor Michael Pate as "Native American" "Watanka". Pate is best known as "Vittorio" in John Wayne's "Hondo" and the vampire gunfighter in the 1959 Western "Curse of the Undead". 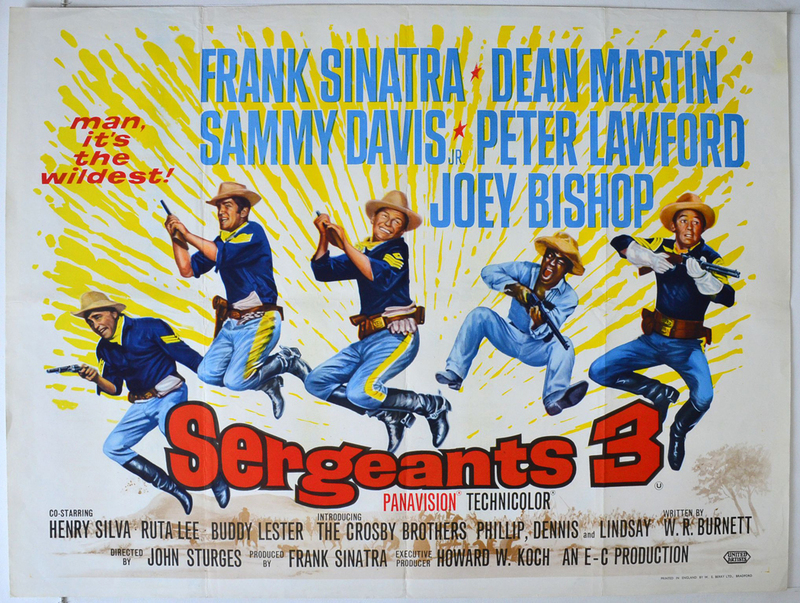 The three title "Sergeants" are fun loving and get themselves in and out of trouble. 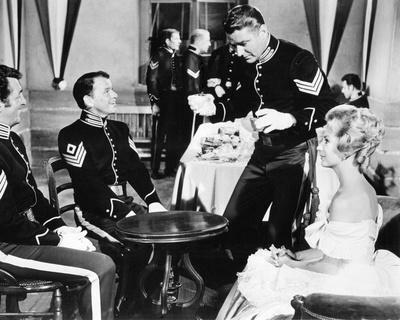 As with "Gunga Din" the audience finds Peter Lawford's "Sergeant Larry Barrett" planning to leave the army to be married to the beautiful "Amelia Parent" "First Sergeant Mike Merry" and "Sergeant Chip Dale" plan to stop him and keep their fun loving group together. Out one night the three "Sergeants" befriend "Jonah Williams" a trumpet playing former slave with dreams of becoming a trooper. As did the British regimental water carrier "Gunga Din". Sam Jaffe as "Din" uses an old bugle at a critical point in the 1939 feature to save the British troops. Below Davis, who did play, with his trumpet. "Mountain Hawk" is leading a tribe of Indians who are terrorizing the area. "Chip" and "Jonah" decide to spy on the tribe. However, the two get captured, but "Jonah" is able to escape and goes for "Mike" and "Larry" for help. "Larry" wants to go, but his hitch in the army is over the next morning and its his wedding day. "Mike" insists to make it legal for "Larry" to go along. He must sign reenlistment papers for another year that "Mike" will destroy after they rescue "Chip". However, the three would be rescuers end up being taken prisoners themselves. The Cavalry troops are heading into a trap being outnumbered by "Mountain Hawk's" tribe and others that joined him. "Jonah" in able to get free and with his trumpet warns the troops by blowing the regiments favorite tune. Unlike "Gunga Din" who dies. "Jonah Williams" becomes a real trooper. "Larry" marries "Amelia" and they leave the fort for their new life together. BUT the crafty "Mike" never tore up "Larry's" reenlistment papers and heads for the Post Commanding Officer. warmed-over Gunga Din in a westernized version of that epic, with American-style Indians and Vegas-style soldiers of fortune. The essential differences between the two pictures, other than the obvious one of setting, is that the emphasis in Gunga was serious with a tongue-in-cheek overtone, whereas the emphasis in Sergeants is tongue-in-cheek with serious overtones. "Variety" like other critics just didn't get it. The fan base loved the film. IF John Sturges can Direct a comedy Western. Why not Robert Aldrich? Comedy was provided by "The Three Stooges". 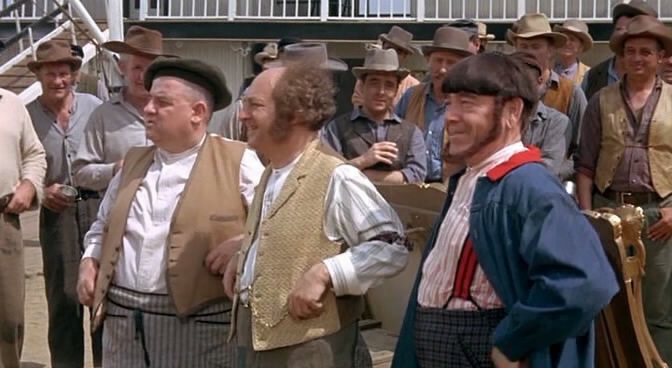 Below left to right: Joe DeRita and the original cousins Larry Fine and Moe Howard. Mike Mazurki was "Zack's bodyguard Chad". Mazurki and Ekberg had portrayed husband and wife in William A. Wellman's 1955 movie "Blood Alley" starring John Wayne and Lauren Bacall. 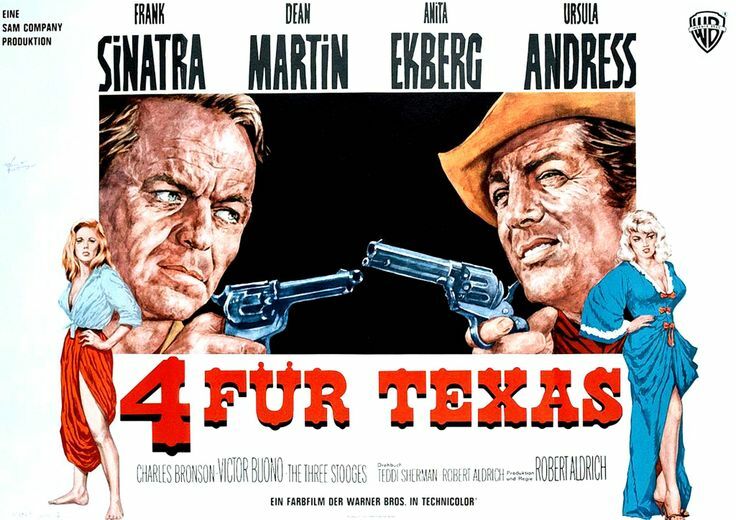 Also in the cast were actors Richard Jaeckel as "Pete Mancini" and Jack Elam as "Dobie". 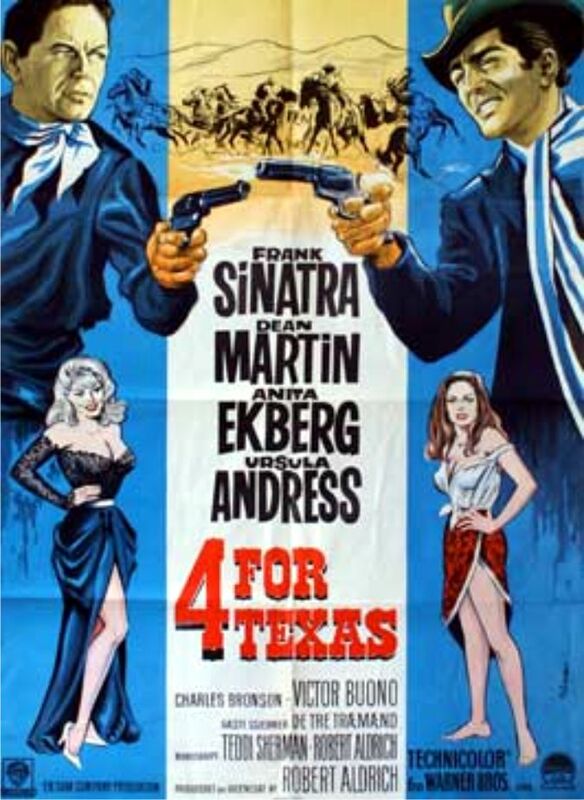 In November 1962 Robert Aldrich announced he was planning a motion picture entitled "Two for Texas". The proposed stars were American actor Aldo Ray, "Battle Cry", "Men in War", "God's Little Acre" and 1960's "The Day They Robbed the Bank of England" with unknown Peter O"Toole,. Along with French actress Martin Carol and American actress/singer Lisa Kirk. The project never got started. Then the Director reworked his screenplay and Dean Martin was hired as "Joe Jarrett". 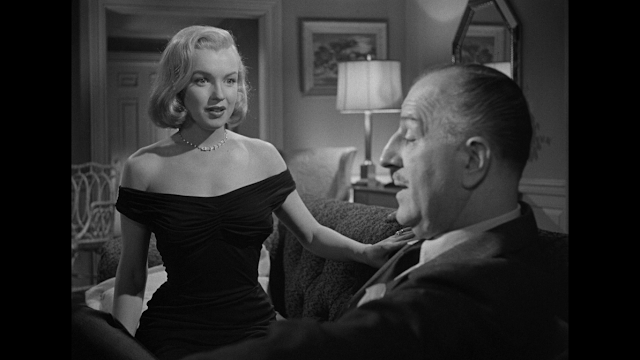 At this point Martin knew Anita Eckberg was to portray "Elya Carlson".The role had originally been intended for Sophia Loren who turned down a million dollars for four weeks of work. The role of "Maxine Richter" was thought to be going to Gina Lollobrigida. Again it did not go as planned and Ursula Andress was hired. 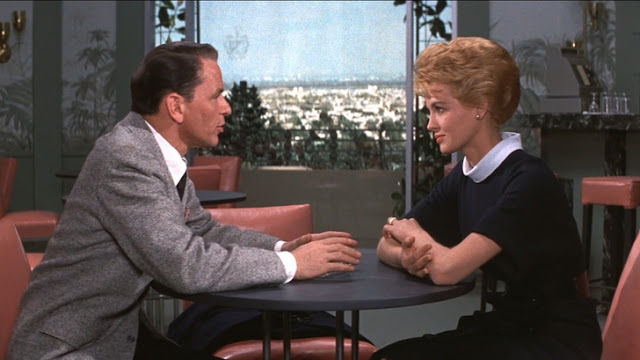 At this point Frank Sinatra also agreed to the role of "Zack Thomas". In 2004 writer Alan Silver in his biography "Whatever Happened to Robert Aldrich: His Life and Films". Claimed Sinatra and Aldrich had a strained relationship on the set. 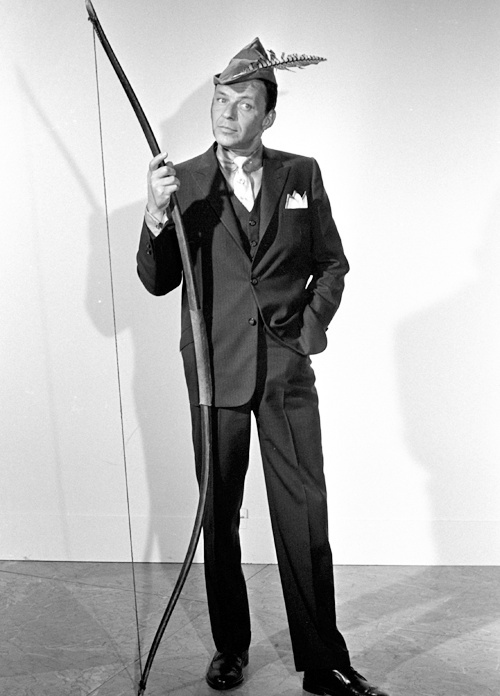 That according to the Director, Frank Sinatra only worked 80 hours out of 37 days of shooting. I leave this comment to my reader's discretion. At one stage of production Aldrich attempted to get Bette Davis to do a cameo. The plot is formula "B" and the year is 1870. Aldrich's revised screenplay has competitors "Zack Thomas" and "Joe Jarrett" going after the same $100,000 shipment of gold. Which is on a stagecoach heading for Galveston, Texas, but "Matson" and his gang want it also.. The two are forced to join to hold him off. Later in Galveston the audience finds "Thomas" and "Jarrett" again as rivals over building a riverfront casino. The two now have girlfriends, "Zack" and "Elya" and "Joe" and "Maxine". There are further problems with the crooked "President of the Galveston Savings and Trust", "Harvey Burden" and his "partner" "Matson".. In the end "Zack" and "Joe" once more join forces to defeat both "Burden" and "Matson", get their girls and save the riverboat casino. American author Howard Pyle wrote several novels about England during the Middle Ages that have been turned into motion pictures. In 1883 he changed a little history and created what became the definitive novel and back story of "The Merry Adventures of Robin Hood". The first motion picture about "Robin Hood" was a silent made in 1908 entitled "Robin Hood and His Merry Men". Between 1908 and 1964 there had been 26 appearances of the outlaw of Sherwood Forest. In 1938 probably the best of the film versions was produced. "The Adventures of Robin Hood" starred Errol Flynn as "Robin Hood", Olivia de Havilland as "Maid Marian", Basil Rathbone as "Guy of Gisbourne" and featured a delightfully evil "Prince John" portrayed by Claude Rains. So if the likes of Douglas Fairbanks, Sr., Errol Flynn, Cornel Wilde, Richard Todd and Richard Greene could do "Robin Hood". Then why not Frank Sinatra and the current "Rat Pack"? 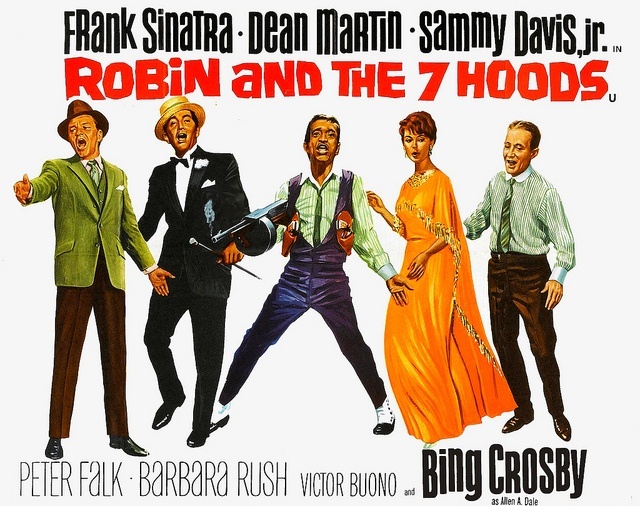 The actual title, although it was dropped, was "Robin and the 7 Hoods, or Who Maid Marian?" The film's Director was Gordon Douglas and if you're a 1950's Science Fiction Fan. You know his 1954 classic "THEM!" starring James Arness and James Whitmore. Douglas had been Directing since 1935 and his films ranged from Laurel and Hardy's 1940 "Saps at Sea", 1945's "Zombies on Broadway" with Bela Lugosi, the 1950 "Rogues of Sherwood Forest" with John Derek as "Robin Hood". To 1953's 3-D Western "The Charge at Feather River" starring Guy Madison and 1961's "The Sins of Rachel Cade" starring Angie Dickinson and Peter Finch. The screenplay was by David R. Schwartz. Schwartz had been writing for 1950 television. He wrote for "The Alan Young Show", "The Red Skelton Hour", the now controversial and politically incorrect "The Amos 'n Andy Show" and "The Donna Reed Show" among others. This was Schwartz's first screenplay. Having seen both homes in question, in my view, there was no difference between them. As far as surrounding homes and what might have been security concerns to this observer. I believe the move did have to do with Frank Sinatra's alleged organized crime ties. According to an article by Michael O'Brien of the "Washington Monthly". Sinatra had been seen in Las Vegas with a young women named Judith Exner. On February 7, 1960 he supposedly introduced her to President John F. Kennedy. Judith Exner claimed to be the Mistress of Florida Mafia Boss, being investigated by Attorney General Robert Kennedy, Sam Giancana, Giancana would eventually become the subject of both Mario Puzo's 1969 novel "The Godfather", with a fictionalized character believed to be Frank Sinatra in it, and the investigation intp the assassination of President Kennedy by the "Warren Commission". On a personal note Judith Exner was a girlfriend of my Great Aunt at one time..
Peter Lawford would be replaced in "Robin and the 7 Hoods" by Bing Crosby as "Alan A. Dale". In 1962 Bing appeared in the seventh and last of his "Road" pictures with Bob Hope and Dorothy Lamour. "The Road to Hong Kong". The first picture had been "Road to Singapore" in 1940. 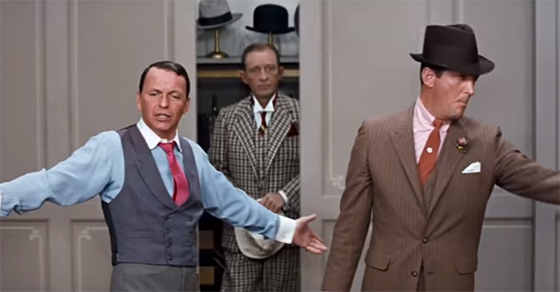 In 1956 Crosby appeared with Frank Sinatra and Grace Kelly in the musical "High Society" and his singing voice was heard in a scene of Sinatra's excellent, see the link below, 1957 "The Joker is Wild". A favorite film of mine. 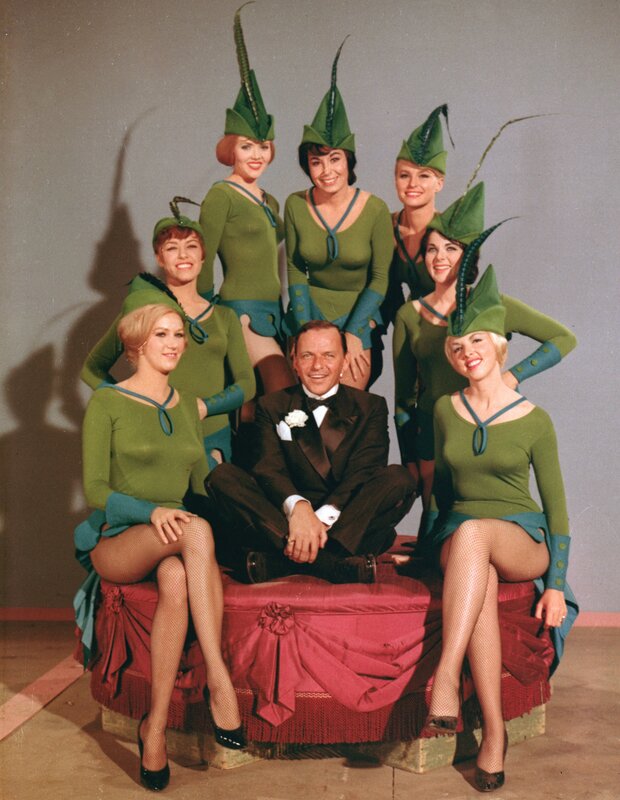 Frank Sinatra was the "Robin Hood" character "Robbo". 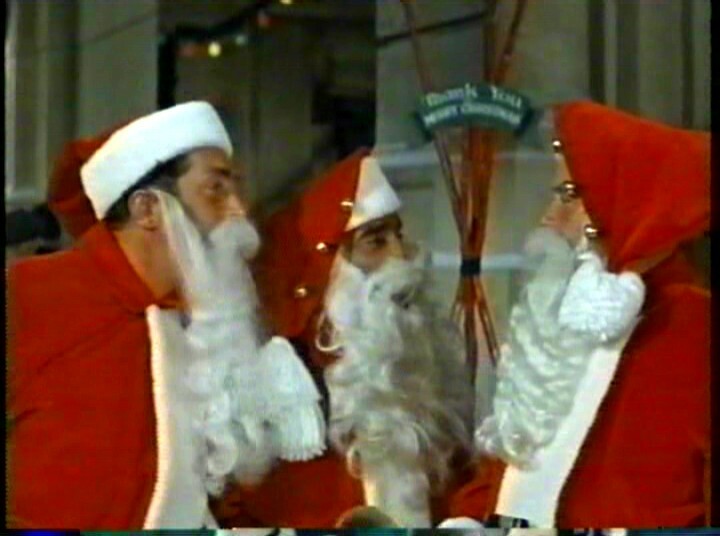 Dean Martin was his second in command "Little John" Below a still from the film with left to right: Frank, Bing and Dean. Sammy Davis, Jr. had the "Will Scarlet" character of "Will". Peter Falk was "Robbo's" competition "Guy Gisborne. Falk started acting on television in 1957. His first motion picture was a forgotten feature about Beatniks and drugs 1959's "The Bloody Brood". 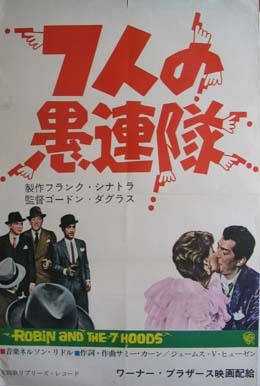 In 1960 Peter Falk appeared in two 1930's gangster films. The first was with tenth billing in "Pretty Boy Floyd", but it was that second role that brought Peter Falk to everyone's attention. The motion picture was "Murder Inc." and Peter Falk was the real life emotionless killer Abe Reles. Who was never brought to trial for over 30 murders. Falk was chilling in scenes of murder and as the man who reveals the entire history of the organization to District Attorney Burton Turkas bringing down Louis "Lepke" Buchalter. Peter Falk was nominated for the Best Supporting Actor Academy Award. Then he returned to television until this picture. Which showcased his comedic talents. Barbara Rush was "Marian Stevens". Once again if you're a fan of 1950's Science Fiction motion pictures. Then you immediately associate the actress to two classics. They are George Pal's 1951 "When World's Collide" and Jack Arnold's 1953 3-D feature "It Came from Outer Space". In 1954 Rush was "Meg" in the Tony Curtis and Janet Lee "The Black Shield of Falworth" based upon Howard Pyle's "Men of Iron". 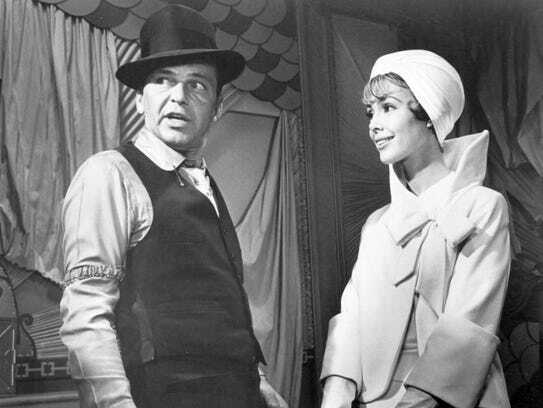 Like many most of Barbara Rush's work was in television, but in 1963 she had fourth billing in Frank Sinatra's "Come Blow Your Horn". Victor Buono had the "Sheriff of Nottingham role" as initially "Deputy Sheriff Alvin Potts". 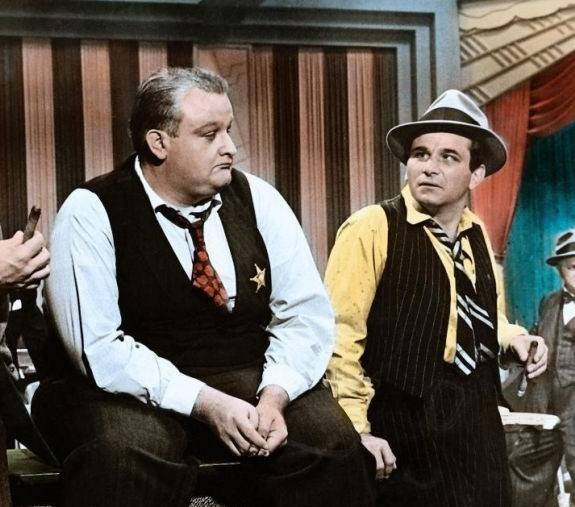 In a non screen credited cameo was Edward G. Robinson as "Marian's" crime boss father "Big Jim Stevens"
The rest of the cast were familiar faces to movie and television viewers of the time. Here are just a few of those faces we knew, but couldn't put a name too. The great Hans Conried was "Mr. Ricks". Tough guy Jack La Rue was "Tomatoes". 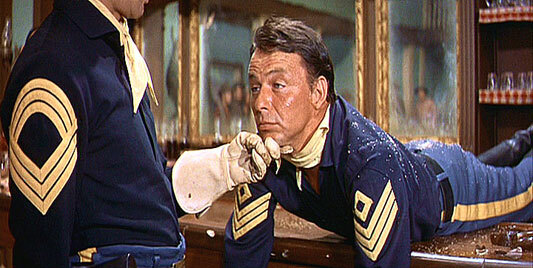 Robert Foulk was "Sheriff Octavius Glick". 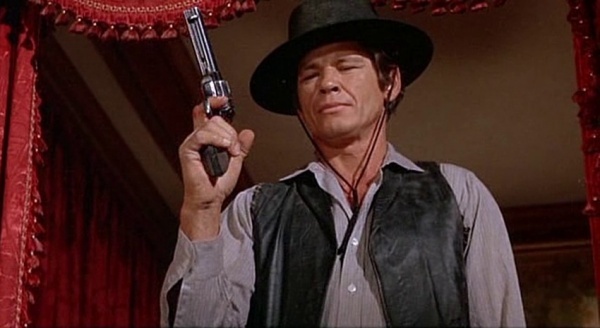 The majority of his 277 roles were on the small screen and his feature appearances were very few, but included James Dean's 1955 "Rebel Without A Cause" and Paul Newman's 1958 "Billy the Kid" movie "The Left Handed Gun". 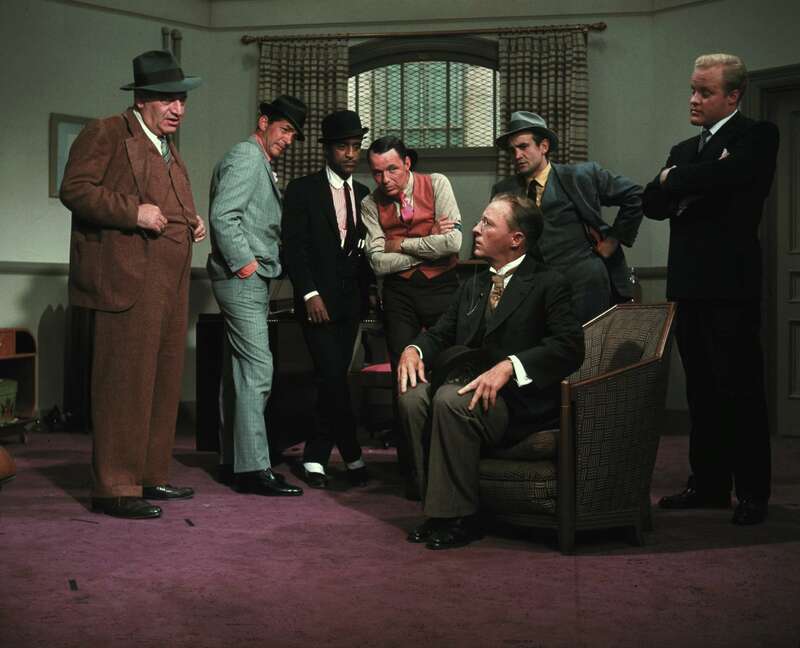 In the following still may reader has on the far left Hank Henry as "Six Seconds" and behind Bing Crosby is Richard Bakalyan in a role described simply as "Robo's Hood. Should the "Hood" on the far right look something like Bing. That's because he's his son Phil Crosby as a "Hood". The picture opens with a Birthday Party for "Big Jim Stevens". It's given by his trusted Lieutenant "Guy Gisborne". Among the guests are the crooked Sheriff and his Deputy. Instead of presents "Big Jim" gets bullets and "Giborne" takes over, but he has one problem and that is follow gangster "Robbo". Below "Robbo" at "Big Jim's" funeral. "Robbo" wants a pool hustler named "Little John" for his gang. As he demonstrates his skill at pool "Little John" sings "A Man Who Loves His Mother"
"Robo" get "Quick Draw Artist" "Will" and some other Hoods together. It should be mentioned that about this time Sammy Davis, Jr. had become a quick draw with handguns he was collecting. "Will" goes to "Gisborne's" bar and shoots the place up singing the song "Bang! Bang!". As the gang war between "Robbo" and "Gisborne" escalates enter "Big Jim's" daughter "Marian". "Marian" asks "Robbo" to avenge her father's death by killing "Sheriff Glick". Whom she wrongly accuses of murdering her father. "Robbo" refuses, but "Guy Gisborne" does put out the hit on the Sheriff. Then appoints his Deputy the new Sheriff working for him. "Marian" wants "Robbo" to join her in taking over Chicago, but he refuses her. When "Marian" sends him money for his under repair club. He sends the money instead to an orphanage and the image of "Robin Hood" begins. As "Alan A. Dale", the orphanage director, notifies the newspapers about what "Robbo" did. "Alan A. Dale" becomes one of "Robbo's" group, but he just looks so drab. So with "Little John's" help the two gangsters attempt to teach the orphanage director a little "Style" in song. "Robbo's" place reopens and becomes an instant hit. However, "Gisborne's" remains empty and after "Will" has shot it up. "Guy Gisborne" goes to his Sheriff to raid "Robbo's". However, "Robbo" has anticipated this possibility and when the police arrive. Instead of a gambling joint. They find a Rescue Mission with the Gospel being preached to the down trodden. A little plot point borrowed from "Guys and Dolls" Those present are led by "Alan A. Dale" to sing of the dangers of "Mr. Booze". "Gisborne's next plan is to have "Robbo" is framed for the murder of "Sheriff Glick". He's arrested, jailed, and is brought to trial. 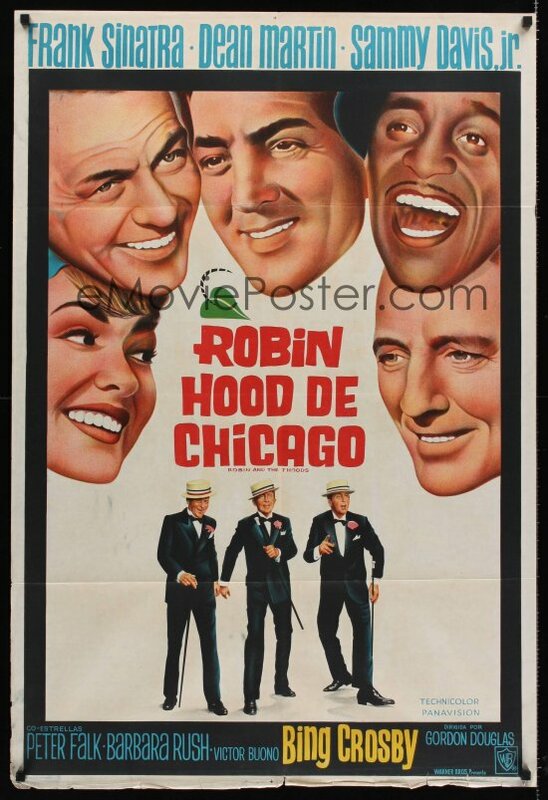 The Jury hears the evidence and finds "Robin Hood" innocent, "Robbo" leaves the courthouse and thanks everyone in Chicago with "My Kind of Town". When "Robbo" returns to his club. He discovers "Marian", who could not get "him to do as she wanted, now has talked "Little John" into running a counterfeiting ring using one of the charities as a front. "Robbo" shows his contempt for what "Marian" has done to his charitable operation and walks out of her mansion. At this point "Little John" realizes his mistake and follows him. She now has lost two men she thought to control. So the devious "Marian" finds another partner in crime in "Guy Gisborne". However, "Gisborne" is actually weak and is killed by "Robbo". Who then tells "Marian" to get out of Chicago. Instead, "Marian" attempts to turn the people against him over the counterfeiting operation she had created. The vengeful "Made Marian" organizes a "Women League for Better Government" and drives "Robbo" out of business. 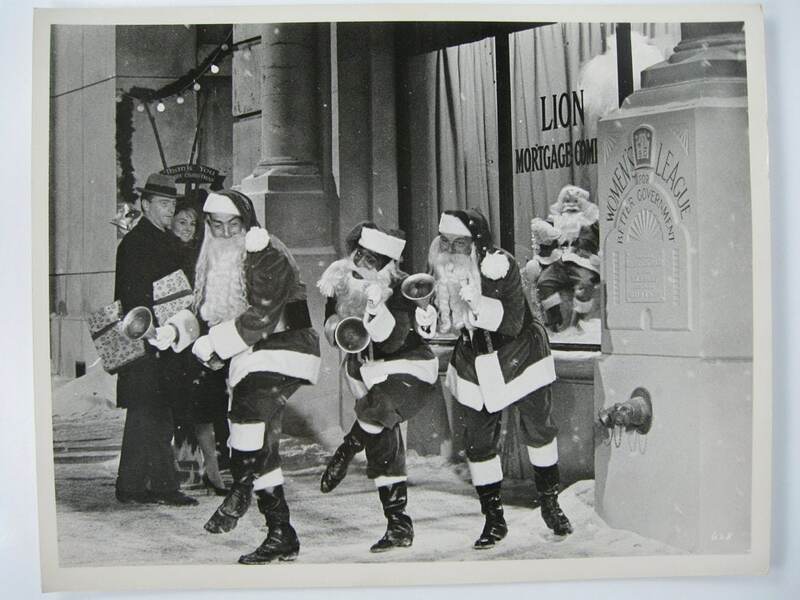 The movie ends with "Robbo", "Little John" and "Will" reduced to "Santa Clauses" soliciting donations for charity on street corners at Christmas. The three are amazed to see an expensive car pull up and "Marian" and her fourth partner get out. That partner is "Alan A. Dale". Below two fun publicity photos of the "Chairman of the Board". 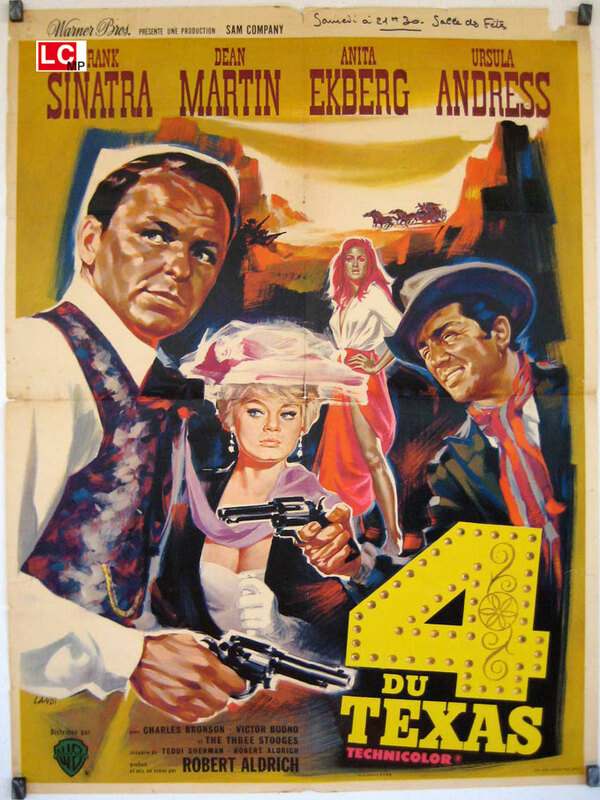 Here are two links to two other articles I wrote about Frank Sinatra motion pictures.